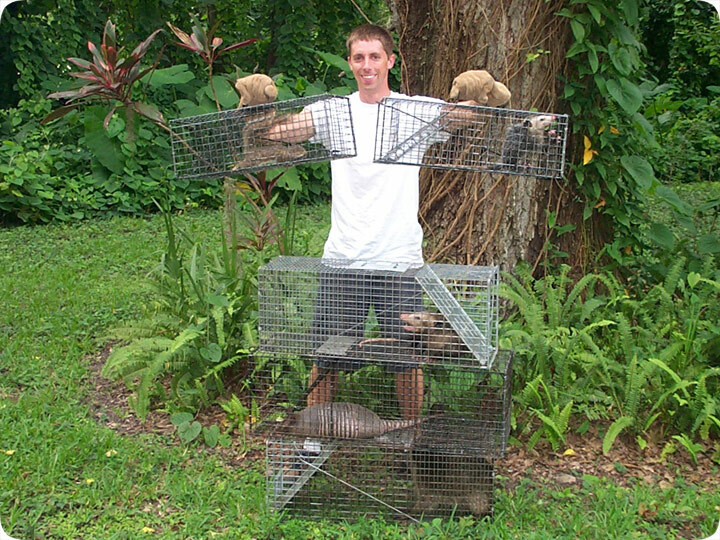 07.03.2003 - If you need wildlife trapping in Orlando Florida, I'm your guy! I'm the rootinest-tootinest critter gitter in all of Florida, yee-haw! I've caught raccoons and squirrels, both boys and girls, from coast to coast, with taters and toast! I catch them mangy musky muskrats, those skivving squirrels, and those tasty armadillos by the bucketload. I'm armed with a steel trap and an itchy snare pole finger, and I can smell a dead skunk from your mother in law with but one whiff of my bloodhound snout. It's late and I'm tired and I'm just writing gibberish, because I want to keep up on this periodic wildlife blogging. But the truth is that I've put in a long, hard day of professional wildlife control work throughout the greater Orlando area. As you can see, I caught squirrels in Winter Park, opossums in Doctor Phillips, armadillos in Oviedo, raccoons in Maitland, and I caught snakes in Conway, and rats in Apopka. I also removed bats in Lake Mary, and got a dead animal out from under a house in Longwood. Then I had to relocate the critters you see in the above photo far outside of Orlando, and it's a long drive. It was a long day. While it is tiring and the hours are very long, I really do enjoy doing wildlife trapping in Orlando. I not only trap wildlife, but I provide a full array of wildlife control services - from attic cleanups, to sealing the homes to prevent future wildlife from getting in, to bat control and dead animal removal, I cover all aspects of wildlife removal. Every job is different, and I'm learning a great deal from each project that I do. I'm often referred by the Orange County Animal Services, when they cannot handle problems with wild animals. Seminole County refers me as well. I am quickly gaining respect in the nuisance wildlife community as someone with a special knack for solving problems between wild critters and people. Every job is a fun problem to solve, and I love getting the animal in the trap. I am always very humane, and I make sure the animals are safely relocated, but most of all, I leave my customers with peace of mind, and a permanent solution to their wildlife problems.